توسلی, حجت. (1393). کاربرد رایانه در احیای دستنویس شاهنامۀ کوچک دوم. آینه میراث, 12(54), 59-108. حجت توسلی. "کاربرد رایانه در احیای دستنویس شاهنامۀ کوچک دوم". آینه میراث, 12, 54, 1393, 59-108. توسلی, حجت. (1393). 'کاربرد رایانه در احیای دستنویس شاهنامۀ کوچک دوم', آینه میراث, 12(54), pp. 59-108. توسلی, حجت. کاربرد رایانه در احیای دستنویس شاهنامۀ کوچک دوم. 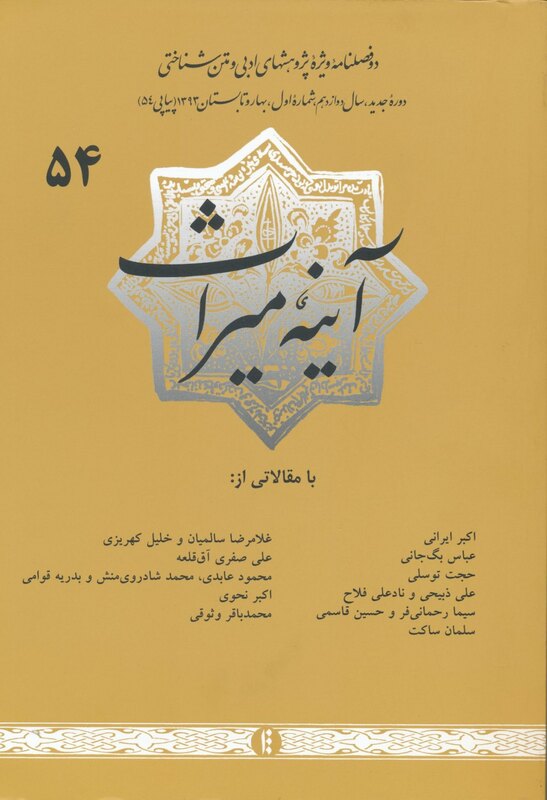 آینه میراث, 1393; 12(54): 59-108. هدف مقالۀ حاضر معرفى یک روش کلى و عام برای احیا و بازسازی تمام نسخ خطی‌ای است که به دلیل پراکندگی صفحات، بازسازی آن‌ها با دشواری یا اشتباه در تشخیص دقیق صفحات و یا برگ‌های اصیل انجام می­‌شود. این روش بازسازی و احیای نسخ در برنامۀ اکسل انجام شده و به شکل خودکار در نه مرحله انجام می­‌پذیرد که به عنوان نمونه در بازسازی دستنویس مصوّر شاهنامۀ موسوم به کوچک دوم، اعمال شده و به احیای درست و دقیق آن انجامیده است. روش بازسازى پیشنهادی، روشی کلی و قابل اعمال در تمام دستنویس‌های ناقص و پراکنده است. دقت این روش را می‌­توان با بازسازی چند نمونۀ دستنویس کامل که براى امتحان و به طور تصنعی ناقص شده‌­اند، مورد سنجش قرار داد. The purpose of this article is to introduce a general method for reviving and reconstructing all the manuscripts that, due to the disorder of their pages and the possible confusion in identifying the exact pages or original folios, it is hard to correctly reorganize those pages. This method of reconstructing and reviving manuscripts has been utilized in the Excel Programme, and automatically takes place in nine stages. It has been used in the reconstruction of the illustrated manuscript of the Shahnameh known as the Second Smaller, resulting in its correct and precise revival. The suggested revival method is a general one and applicable to all defective and disordered manuscripts. Its precision can be tested by reconstructing several complete manuscripts artificially made imperfect. - خالقی مطلق، جلال، 1997، «آمار ابیات محذوف در شش دستنویس شاهنامه»، ترجمۀ محمود امید سالار، مجموعۀ ایرانیکا. شمارۀ 26. - فردوسی، ابوالقاسم، 1386، شاهنامه، به کوشش جلال خالقی مطلق، تهران، مرکز دایرةالمعارف بزرگ اسلامی. - فردوسی، ابوالقاسم، 1971، شاهنامه انتقادی، به کوشش آندره یوگنی‌­یوویچ برتلس، مسکو، انتشارات دانش شعبۀ ادبیات خاور. - مهران، فرهاد، 1386، «بیت مصور، پیوند بین متن و نقش در نسخه­‌های شاهنامه»، سالنامۀ نامۀ بهارستان، ش 8ـ9، دفتر 13ـ14. - Adamova, A.T.; and Giuzalian, L.T., 1985, Miniatury rukopsisi Poemy Shahname 1333 goda, with ummary in English, Leningrad, Iskusstvo. - Blair, Sh.S., 1986, “On the Track of the 'Demotte' Shahnama Manuscript,” Les manuscripts du Moyen Orient. Actes du Colloque d'Istanbul, 26-29 mai 1986, ed. F. Déroche, Varia Turcica, VIII, Istanbul and Paris. - Grabar, O.; Blair, Sh. 1980, Epic Images and Contemporary History. The Illustrations of the Great Mongol Shahnama, The University of Chicago Press, Chicago and London. - Inal, G., 1972, Topkapi Sarayi Müzesindeki Sehname Yazmalarinin Minyatürleri Ũzerinde Analitik Çalişma, Istanbul. - Masuya, T., 1994, “The Condition of the Metropolitan Museum of Art's Small Shahnama and the Reconstruction of Its Text,” Illustrated Poetry and Epic Images. Persian Painting of the 1330s and 1340s, The Metropolitan Museum of Art, New York. - Mehran, F., 2006, “The Break-line Verse: The Link Between Text and Image in the 'First Small' Shahnama,” Shahnama Studies I, ed. Charles Melville, Pembroke Papers, The Centre of Middle Eastern and Islamic Studies, University of Cambridge. - Mehran, F., 2011, “Mapping Illustrated Folios of Shahnama Manuscripts: The Concept and Its Uses,” in Shahnama Studies II, ed. Charles Melville, Pembroke Papers Series, Cambridge, ]forthcoming[. - Simpson, M. Sh., 1979, The illustration of An Epic. The Earliest Shahnama Manuscripts, New York and London. - Simpson, M. Sh., 2000, “A Reconstruction and Preliminary Account of the 1341 Shahnama,” Persian Painting. From the Mongol to the Qajars, ed. Robert Hillenbrand, I.B. Tauris Publishers, London and New York. - Sotheby's, 1998, Oriental Manuscripts and Miniatures, Sales Catalogue, London, Wednesday, 29 April. - Swietochowski, M. L., 1994, “The Metropolitan Museum of Art's Small Shahnama,” Illustrated Poetry and Epic Images. Persian Painting of the 1330s and 1340s, The Metropolitan Museum of Art, New York.